All you need to know about how complicated a character Evel Knievel was can be drawn from the following comments. Asked what Knievel would think about the new Being Evel documentary, which opens nationwide today (Friday, Aug. 21), BMX stunt prodigy Mat Hoffman chuckles. “He’d say, ‘Oh, man, right on!’” says Hoffman, a longtime friend and former business partner of Knievel's. “He had a really extraordinary life,” says Knoxville. “You'll see how intelligent the man was, and the P.T. Barnum-level showman he was. You’ll see his public side, and you’ll see the truth of his private side. Some of those things are disappointing, and tough for me to reconcile, honestly, because I’m such a fan. But we wanted to be honest about it, about what kind of husband he was, how he handled himself when no cameras were around. What Knoxville, co-producer Jeff Tremaine, and Oscar-winning director and screenwriter Daniel Junge did was create an unvarnished documentary that commemorates one of the quintessential showman and athletes of his generation, while stripping away the veneer that Knievel—born Robert Craig Knievel on Oct. 17, 1938—had carefully crafted over his swashbuckling 30-year career. Knievel died in 2007, at 69, of heart failure. The documentary lists a Who's Who of modern-day thrill-seekers, many of who were motivated by Knievel’s exploits decades earlier. People like Hoffman, Nitro Circus star Travis Pastrana, and skateboarder Tony Hawk. 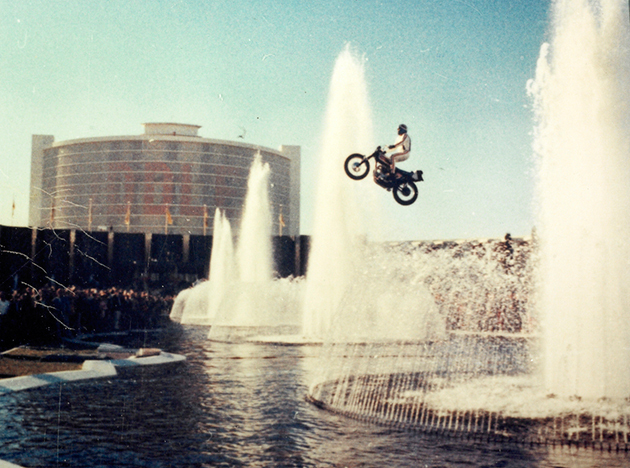 Knoxville said extreme sports—from Nitro Circus to ESPN’s X-Games—owe a debt of gratitude to Knievel. A native of Butte, Mont., and later inspired by the Joie Chitwood Auto Daredevil Show, Knievel became a pioneer of the action-sports genre. ​“I just remember him being such a large figure in my childhood,” Knoxville says. “There was no one bigger than Evel Knievel. There were some people equal to Evel Knievel, like Muhammad Ali and Elvis, in my mind. [Knievel] was one of the biggest figures of the 20th century, definitely one of the largest personalities. To provide a more complete portrait, the documentary also features a number of Knievel family members and former co-workers and friends, including promoter Shelly Saltman and celebrities such as George Hamilton, the late Frank Gifford, and Geraldo Rivera. ​“We just wanted to show a full picture of just how complex this man was," said Hoffman. "The family really doesn't want to show the dark side, either, but I've been with the family, and been friends with Evel for a long time, and they had confidence that we would tell the real story and tell it right and keep it balanced to justify what a legend he really is. Hoffman saw Kneivel’s guarded side first hand, when the two first met. They eventually became longtime friends, and worked together on a Knievel line of bicycles. That led to a classic episode revealing ’Knievels compulsive nature. “When we decided to do bikes, I agreed to bring a cashier’s check for $25,000 to Caesars Palace, and we’ll sign a contract,” says Hoffman. “I thought, ‘Well, that's a lot of money, and this is kind of crazy, but it’s Evel Knievel.’ So I said sure. 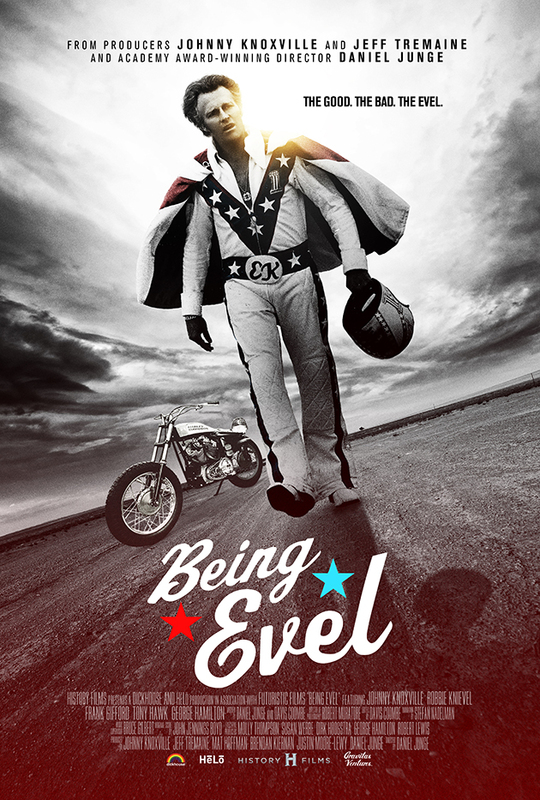 ​Of course, Being Evel offers numerous highlight-reel moments of Knievel, resplendent in his stars-and-stripes trimmed white leathers, including the career-defining crash at Caesars Palace in Las Vegas in 1967, the failed 1975 jump before 90,000 at Wembley Stadium in London, his last big jump later that year at King’s Island in Ohio, where he successfully cleared 14 Greyhound buses, and the bizarre, botched spectacle that was the Snake River Canyon jump in Idaho. 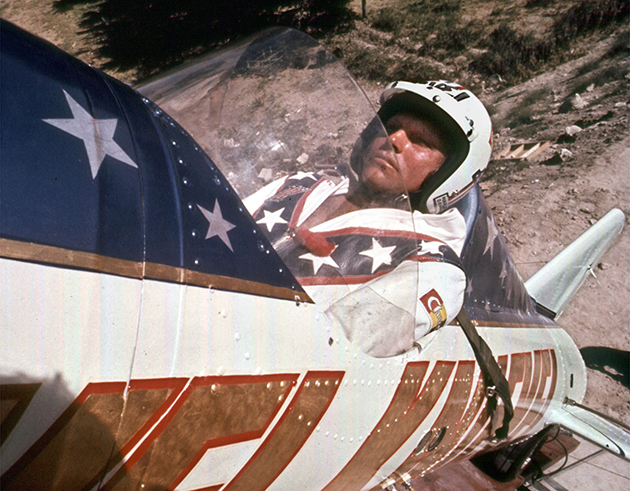 After the Caesars crash, which wasn’t shown live, Knievel became must-see TV (he was featured in seven of the 10 highest-rated episodes of ABC's Wide World of Sports). Knievel drove that agenda with the same entrepreneurial knack that persuaded the Czechoslovakian national hockey team to visit Montana to play an exhibition against his semi-pro Butte City Bombers in 1960, in the midst of the Cold War. But the disastrous moments took their toll. Knievel’s litany of injuries includes more than 400 fractures (433, to be exact), which landed him in the Guinness Book of World Records. It also landed him in the hospital countless times. The lack of modern medical care wasn’t the only impediment to Knievel’s career trajectory. The motorcycles he rode, and jumped, where a far cry from today’s stunt-specific rigs (his iconic 300-pound Harley-Davidson XR-750 is on display in the Smithsonian Institute). "He was jumping on bikes not made for jumping, because no one had ever jumped a bike before," said Knoxville. "They weighed twice as much as today's bikes, and didn't have any suspension. And not enough power. He was jumping dump trucks, basically." ​That fact simply fed the legend. But the character, and the man, were often at odds, says Knoxville. “He really painted himself into a corner,” he says. “He even said, himself, ‘I created Evel Knievel, and he sort of got away from me.’ It’s a hell of a thing to live up to. Unlike far too many gunfighters who wound up on the wrong end of the draw, however, Knievel seemed to have nine lives. That, says Hoffman, may be the entertainer’s greatest achievement.